A couple of weeks ago, I took a deep look at the video for St. Vincent’ “Digital Witness” and now that I’ve had time to fully digest the whole package, I think I understand it all a little better now. St. Vincent’s self titled album isn’t a departure from her older material, it’s a continuation past the present day. Let me try to explain. The images of St. Vincent a.k.a. Annie Clark on tour, in the video and even on the cover have an odd sci-fi vibe. On the cover, Clark’s seated on a throne in a sparkling, sci-fi dress and a wild hairdo. In the video for “Digital Witness”, she’s stuck in the corner of a futuristic campus where there are no windows and no plant life. And when she’s on stage, she’s playing a black Music Man Albert Lee guitar on a black, atmospheric set, often wearing a black outfit. Everything seems a lot bleaker these days. In my prior piece, I noted how “Digital Witness” had a real lack of guitars. But elsewhere on the album they’re back, all over some of the tracks. “Birth in Reverse”, to name just one standout, has some of her best playing ever: raw, wild dive bombing where you can all, but see her tearing the frets out of her guitar. There was an interview a while back where Clark talked about her unique, record scratch guitar tone. This tone expressed a sense of angst she had a hard time expressing in words. Now it’s more than just the tone: her vocals sound like they’re coming out of a computer and the drums rattle, sounding like they’re coming from a half-broken 808. And the guitars! Clark bangs out riffs like it’s nobody’s business. On “Birth in Reverse”, she bangs out noisy, post-punky riffs, while on “Regret” she plays lines with her unique, finger-picked style. On “Psychopath” she plays a bona-fide guitar solo! Remember folks, she’s one of the best guitarists in rock today. But what’s most interesting are the songs where her guitar playing takes a back seat to her singing. It’s to best effect on the ballad “I Prefer Your Love”, where she sings lines like “all the good in me is because of you,” to an unresponsive mother. It’s the most emotional song on the album and the most human-sounding one, too: packed in the middle of a group of songs that sound so futuristic, so tense and nervous, it packs a hell of a punch. It’s maybe my favourite song on the LP. 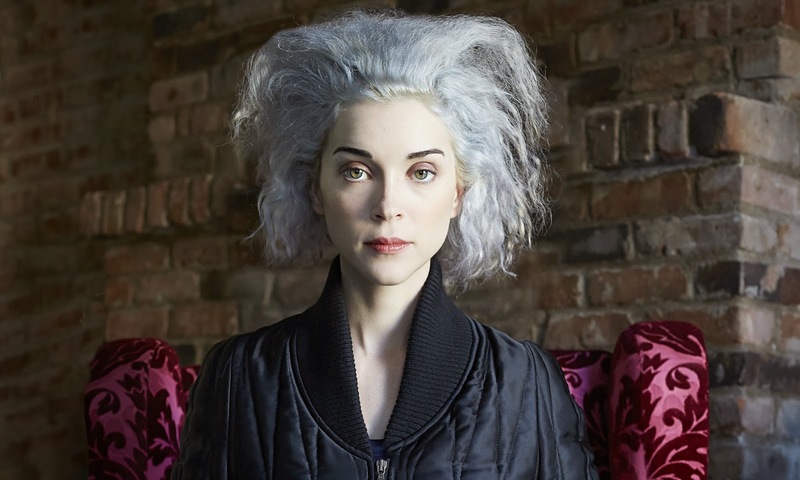 Occasionally, St. Vincent shows the influence of David Byrne and her collaborative album with him: there are the riffing horns on “Digital Witness”, for example, or her fractured lyrical approach. But she takes it all a step further, making it all her own. Every instrument, voice and even sound is processed, digitally tweaked and manipulated until they barely sound like the real thing. And that’s exactly the point: in this dystopian landscape, nothing is real anymore. I can’t shake the feeling of a warning theme throughout the lyrics on St. Vincent. Lines like “the birds will cry, let them cry,” or “I prefer your love to Jesus,” have an ominous undertone, a feeling that things are a lot darker than they seem. But elsewhere she barks orders: “Get back to your seat!” she shouts on “Digital Witness,” before telling us she wants all of our minds. But more often than not, she’s concerned for us: we’re turning our TVs on and staring at them like it’s a window. When she shouts “bring me your loves, all of your loves,” she sounds like a digital Siren, trying to lure us closer to a digital shipwreck. On this self-titled album, Annie Clark’s more ambitious than ever, with a sonic palette that seems beamed down from Mars (or perhaps Neo-Tokyo). She’s gone beyond singing about modern-day immediate concerns, turning instead to a dark, impersonal future. And while it could’ve bogged down under it’s own weight and collapsed, it never does. Instead it’s a striking, compelling listen: every time I cue up the damn thing, I listen to it all the way through. “Oh what an ordinary day,” sings Annie Clark on “Birth in Reverse”. Don’t believe it: her fourth LP is anything, but ordinary. It’s my favourite record so far in 2014 and I bet it it’ll still be up there come December.